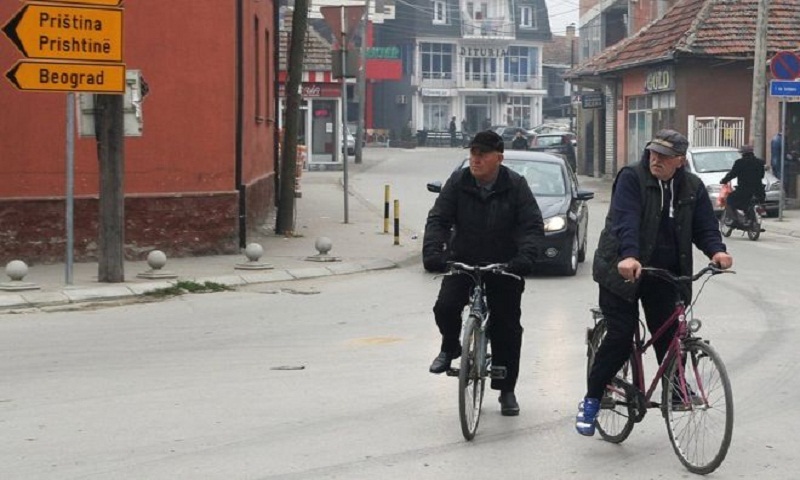 "Albanians and Serbs don't use the same bars," says Valon Arifi, an ethnic Albanian. The town's population is majority Serb, but in the wider region Albanians are more numerous. That is why the Presevo Valley has been at the heart of speculation: could it be part of a land-swap deal to end enmity between Serbia and Kosovo? "[People here] only drink coffee together if they're doing business," says Valon. "But drinking together like friends? That doesn't happen." And if you order an espresso in the "wrong" cafe in Bujanovac, you will soon get the message. "You can read the wi-fi password: something like, 'Albanians not welcome here'. And in Albanian bars, it could be something like that against Serbs," he says. Ethnic separation is the stuff of life in the Presevo Valley, an impoverished corner of Serbia. Where you live, the school your children attend, the language you speak and whether you go to a church or a mosque will all reflect your origin. Since Serbia and Kosovo fought a bloody war that ended in 1999, relations have remained tense. Serbia never recognised Kosovo's independence, declared in 2008. But the European Union wants Serbia to reach an accommodation with its neighbour before moving on Belgrade's EU membership. Kosovo, meanwhile, wants formal recognition at the UN which is blocked by Serbia's ally, Russia. One dramatic - some say unthinkable - solution to ending the rift, could be an exchange of territory along ethnic lines. Kosovo would gain the Presevo Valley, and the mostly Serb region of north Kosovo would become part of Serbia. But nothing has been decided, and no-one knows where new borders could be drawn. While talks have stalled in Brussels, tensions have increased - Kosovo has slapped 100% tariffs on Serbian goods. Now there is pressure from Washington. President Donald Trump has made a direct appeal to the leaders of Serbia and Kosovo, urging them to make peace. North-west of Bujanovac, even closer to the border with Kosovo, the community of Trnovac is exclusively Albanian. The proposal that the Presevo Valley should join Kosovo is not new. After the war, Trnovac became a hub for a paramilitary force that fought Serbia until 2001 with the aim of achieving just that. Aridona Shabani, home for the holidays from medical school in the Albanian capital Tirana, would like it too. Growing up, she never had any Serb friends and speaks little Serbian. "I don't like the language," she says. "It's not interesting like English or French." Her mother Xhevahire may not drink coffee with the Serbs she knows, but she does speak the language. "We lived in the former Yugoslavia when Serbs and Albanians were supposed to be unified," she reflects. "This generation grew up in a time of war, when hatred was promoted. Those harsh experiences have made young people turn away from each other." A few kilometres east, Rakovac is strung out along a road bordered by cabbage fields. "Rakovac is a very old Serbian village. We don't want to be part of Kosovo," says Vukasin, who is in his 20s and does not want his surname used. If the border were redrawn and Rakovac became part of Kosovo, would there be a risk of violence? "It could happen," says Dragoslav, who like many here is unemployed and scratches a living from cutting and selling wood. Tired of politics, Stojko Janic regrets the chasm that has grown between the communities. "I worked with Albanians for 17 years," he remembers. "I had better friends among them than I had among Serbs. They still want to be my friends, but they're afraid to be seen with me, because they will be seen as traitors to their community." In one arena, at least, bonds are still being forged across the divide in the Presevo Valley. On the basketball court at Play 017 in Bujanovac, young people of Serb, Albanian and Roma origin train together. "When I was growing up we all played together, but things changed here because of the war," says club founder Nenad Stajic, who is Serbian. "I have a philosophy: everywhere in the world, kids cry the same, there's no difference between them. Young people here learn to live together, work together, and make friends." Hevzi Imeri, ethnically Albanian, and Danilo Dabetic who is Serbian, are both aspiring professional players and great friends. "Danilo's like my Albanian friends, only he speaks a different language," says Hevzi, who speaks good Serbian. And this is a partnership that defies the great coffee-culture divide in Bujanovac. "We go out to drink coffee, hang out, go to birthday parties together," says Danilo. But all that could change if the borders of the Presevo Valley are redrawn.